﻿ CIXI JIUCHI ELECTRICAL APPLIANCE TECHNOLOGY CO., LTD.
CIXI JIUCHI ELECTRICAL APPLIANCE TECHNOLOGY CO., LTD. is located in Cixi, Ningbo -- a developing coastal city. The transportation is very convenient. 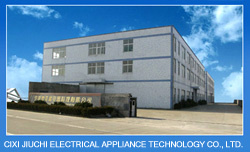 Jiuyi is a professional manufacturer of electric appliances. Our company devotes to researching and developing various kinds of products including PTC air warming towers, oil-filled radiators, Halogen & Quartz heaters, fan heaters, mica heaters and other related products. We have the latest equipment and the best technology. It is our great honor If you would visit our company. 3 Heat settings (Minimum,Medium and Maximum) for a more efficient energy management.